We bring you a mod that generates important towns across biomes Minecraft. More Village Biomes 1.6.2 and 1.5.1 generate biomes as villages, jungles, forests, high mountains, in swamps, in the normal plains, deserts and the icy plains of Minecraft, among others. So as these villages will be in new areas, also building their villages will be different, or rather use other materials for construction. Also the spawn rate of peoples is higher and more easily find them. So, strat exploring! How to install More Village Biomes Mod for Minecraft 1.6.2? Paste the downloaded file into mod .minecraft / mods folder. 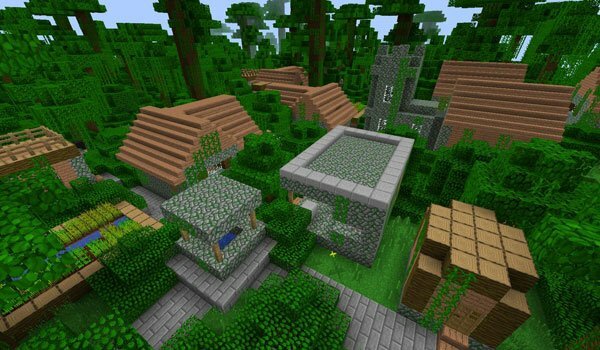 How to install More Village Biomes Mod for Minecraft 1.5.1? Paste Forge API files inside “minecraft.jar”. Paste the mod downloaded file, inside “minecraft.jar”. More villages, in more biomes with different looks!